Most of us think Indian vegetarian food is easy and fuss-free, but truth to be told, very few restaurants in the city get it right. One such place is the legendary R Bhagat Tarrachand in Camp, next to Wonderland. 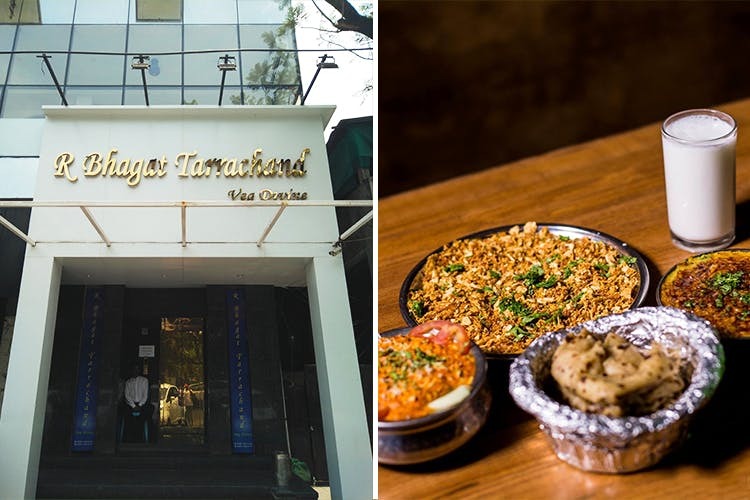 For many years now, R Bhagat Tarrachand has been winning our hearts with it’s authentic Mughlai and Rajasthani food. From succulent tandoori mushrooms to paneer tikka masala and their classic Hyderabadi biryani, their 5-page menu is full of vegetarian delights. As for us, we land up ordering our usual out here. Must try the kadai paneer with a side of desi ghee chapati, along with dal khichdi and veg Peshawari. Wash down your food with a glass of salted lassi. Now that’s a meal that only costed us INR 770 for two (excluding taxes). Over and above their food, R Bhagat Tarrachand has an extremely traditional ambience – soft beige colours everywhere, tables that can easily accommodate big families and stunning Indian artwork on the walls. The staff is extremely courteous and friendly. R Bhagat Tarrachand also has another outlet on Laxmi Road in City Jewel Mall.